How can I save money with solar power? In tropical islands, solar power is cheaper than diesel-generated power, and, therefore, generates savings for each unit of solar power produced. Our solar solutions are built to perform 30 years to ensure that our products are safe long-term investments. We also offer financed systems, with zero investment cost for the customer and savings from day one. What can a solar system power? Technically –anything, depending on the size and parameters of the system. Usually, we connect the solar system to your existing power grid. In such way, all the solar energy produced always gets shared by various users within your grid, taking the electrical load away from generators and generating savings. 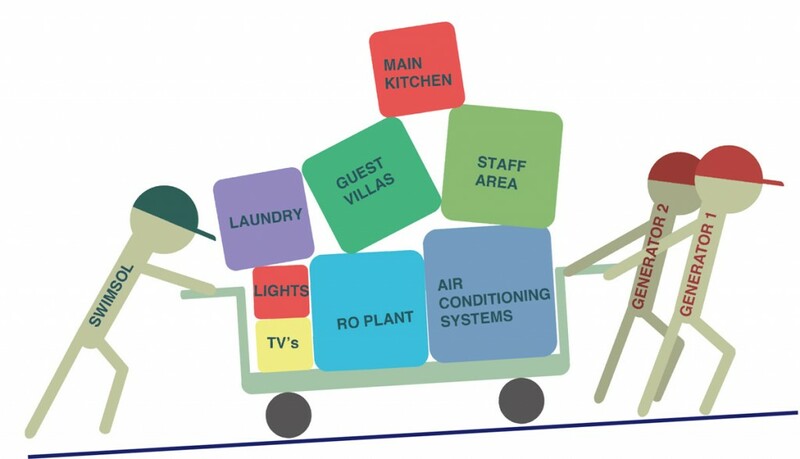 Please see the analogy with people pushing a trolley full of typical consuming facilities of a Maldivian resort. Swimsol systems can also be used off-grid where required. I would like to introduce solar power into my facility. What do I need to start? Generally there are no special requirements, and solar power is integrated into your existing system. Swimsol provides complete solutions from planning all the way to monitoring & maintenance. Simply get in touch with us, and we will be happy to help you get started. What do I need to maintain the solar system? Solar systems require only minimal maintenance. Swimsol provides solutions that include monitoring and maintenance; systems are monitored via live Internet feed. When required, Swimsol reacts swiftly to any problems that arise. What is the expected lifetime of a Swimsol system? Working with electronics in the tropical marine environment is a challenge. We, therefore, searched for high-quality components, subjected them to stress testing and selected only the best for our systems. We use heavy-duty, high-performance panels developed specifically for tropical marine regions, and our systems have a lifetime of around 30 years. Will solar power reduce my diesel consumption? Yes, if you are using diesel generators. We connect our solar systems into your existing power grid, and solar helps generators to carry the power load. Whenever the sun is shining this setup generates diesel savings; i.e. whatever power solar systems produce, diesel generators do not have to. Please see the analogy with people pushing a trolley full of typical consuming facilities of a Maldivian resort. How much diesel can I save with solar? This depends on the size/capacity of the solar power system. Up to 30% of diesel can be saved in a typical Maldivian resort, without large-scale battery storage. Can my diesel generators be turned off? When systems are correctly dimensioned, it is possible to completely shut down some of the generators during the sunny days, which generates extra savings. Do I need large long-term storage batteries? If you already use diesel generators (or another power source), Swimsol can integrate into your system without long-term storage batteries, as a hybrid solution. In cases where a purely solar (off-grid) system is required, long-term battery requirements vary on a case-to-case basis. Feel free to get in touch. How big is a single solar panel, and what does it produce? 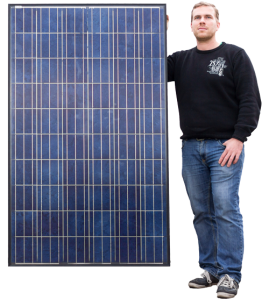 A single solar panel is around 1.7m x 1.0m (1.7m2) size, and has a nominal capacity of around 260 Watt. A single solar panel could power two modern LCD TVs during peak production times. How many solar panels do I need to power an Air Conditioning Unit? Air conditioning units have high-energy consumption and range from 2 to 5KW. This means that to run a single air conditioning unit just during sunny hours, 10-22 solar panels may be required. What is the weight of solar panels? On average, rooftop solar panels and mounting system used by Swimsol weigh around 17kg per square meter (3,42lbs per square foot). Is SolarSea suitable for my property ? SolarSea™ is designed for sheltered areas of the sea such as bays and tropical lagoons. Get in touch with us with your coordinates, and we will investigate the suitability of your location. What is the size of SolarSea system? SolarSea™ consists of separate floating platforms of 196m² that can be arranged in a system of any required size.